Buy Lavera basis body lotion 200ml in the UK from our online shop or directly from our independent Scottish store. Lavera body lotion with organic jojoba and organic aloe vera. Lavera Moisturising Body Lotion from the basis sensitive range has an improved lighter, but still intensively moisturising, formula, suitable for those with sensitive skin as well as all skin types. Pure natural fragrance from natural essential oils. As official Lavera stockist, we sell genuine Body Lotions, Oils & Scrubs directly from our shop in Scotland and online throughout the UK. Where can you buy real Body Lotion safely online? If you are wondering where you can buy Lavera basis body lotion 200ml safely online in the UK, then shop with us. We are an actual health foods shop; with real people selling real foods and products. Our award-winning independent shop is located in Stirling, Scotland since 1976. You can buy our Natural cosmetics and organic skincare and other genuine Body Lotions, Oils & Scrubs in store or safely place an order with us online or over the phone. 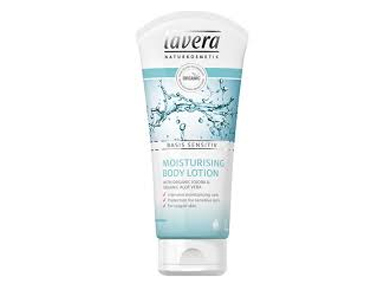 Body Lotion - Lavera basis body lotion 200ml in Body Lotions, Oils & Scrubs and Personal Care.